The Bridge Shelter in Cortez, Colorado, enlisted the help of Cortez Web Services to redesign their website with a more engaging layout in mind. The website redesign features updated content and images, and special built-in features to allow the organization to post current shelter needs, and connect with volunteers and donors. 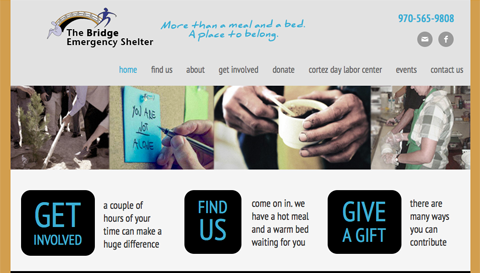 Clear calls-to-action and large, bold text on the home page add compelling elements to help give The Bridge Shelter an edge when it comes to recruiting volunteers – a valuable asset to this non-profit organization. In need of a website redesign for your non-profit organization? Ask us about our non-profit discount!